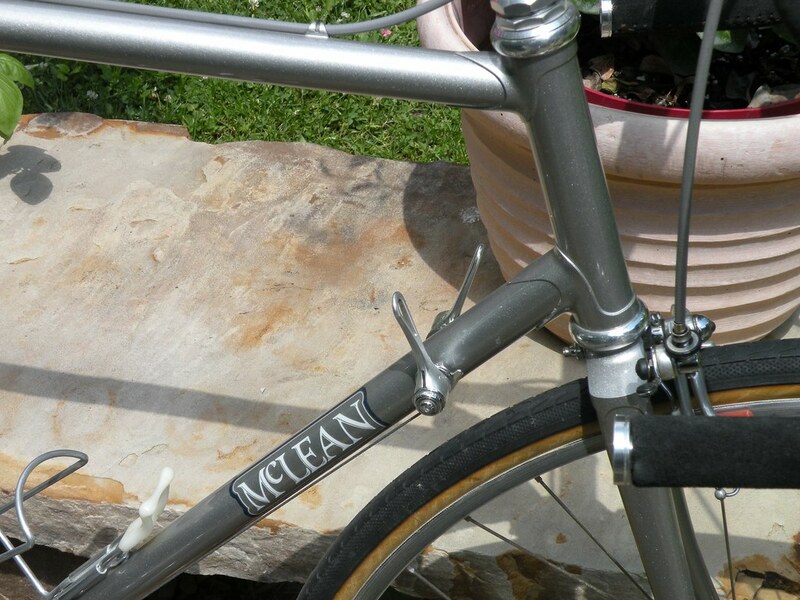 There is a small handful of members with McLean bicycles. Let's post pictures. I have a good friend who is a good photographer, and I will ask him to shoot my McLean, because my pictures are terrible. He happens to own a McLean, too! He got his first, in 1982, which made me aware of the name. Then a year later, someone offered to sell me his, so I snatched it up. It was only a year old then. Last year, I was thinking I don't ride it much, and maybe I should sell it. I was telling myself that sentimentality shouldn't get in the way of practicality. I rode it last week and realized that I love this bike not only because it's beautiful and not only because I've owned it for a long time, but it rides amazingly. It is actually a fairly practical bike. I have toured and commuted on it. These days, I use it for weekend rides. Here it is, two weeks ago, after a 50-mile very hilly ride. I've removed the Campagnolo Nuovo and Super Record drivetrain and replaced it with a 3x9 Shimano drivetrain. I haven't got the left shifter to work yet, so for now, I'm using a downtube shifter for the front derailleur. Here is my album of pictures of the bike. I'll add some pics and backstory when I settle in later today. It will be a hoot to see who stops by with their McLeans. Very few of these out there. As I said, I bought the frame set in 1983. It had a light blue metallic paint job. After some abuse and dents and rust, it was time to fix that. Then as I was cleaning it with solvent, I wrecked the decals, so that made the matter even more weighty. 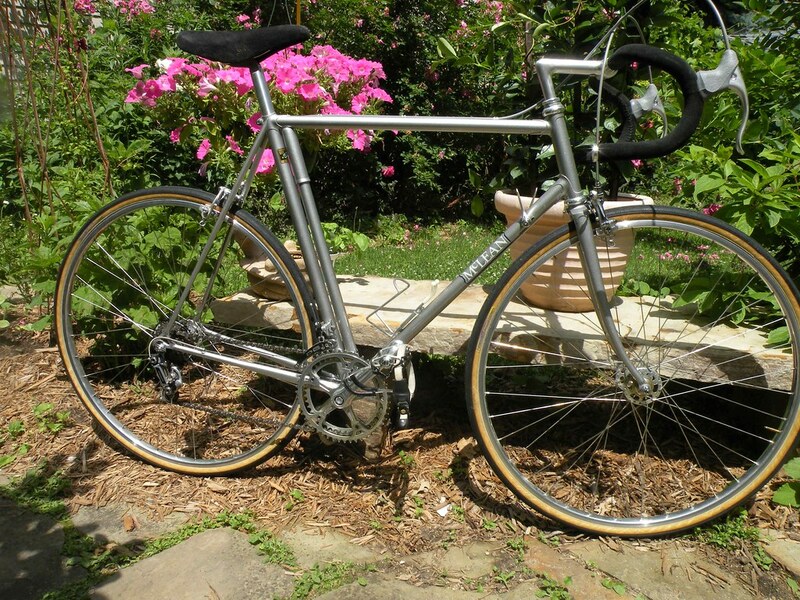 The frame came with no braze ons, and three years earlier, I had taken a long tour on a racing bike, and I still didn't realize how silly that was. So I decided to outfit my frame set for touring. Silly, yes, but there's no harm in it, either. In about 1991, I sent the frame set to Peter Weigle. He filled the dent(s) and added lots of braze ons: top tube brake cable guides, BB gear cable guides, bottle bosses, and rack bosses on front and rear. He installed a Shimano 600 headset. He spread the dropouts to 126mm, as they were originally spaced at 120mm. I'm now thinking of spreading them further to 130mm. The pictures do not capture the actual shade of purple. As most of us know, Weigle does absolutely top notch work. He had his ex-wife Betsy do the painting. At the time, they were still business partners to some extent. Betsy did a top notch job on the paint. I am clumsy with bikes and tend to get them scratched a lot. I've scratched this a lot, but the paint would be worse if Betsy hadn't done such a great job. He died, at 29 years, of an unforeseen heart failure in his basement while riding an exercise bike. McLean was a non smoker, a vegetarian,& a fit person who only a year or so before his death had married Lanier. He was finally becoming well known after an 11 year career run at making frames. Toward the end, Cycle Imports in Cornish, Maine, had become an effective national sales outlet for the frames. McLean frames were displayed in the Cycle Imports booth at a few New York International Bike Shows and sold around the country in small numbers. There were a surprisingly large number of orders going to Texas. 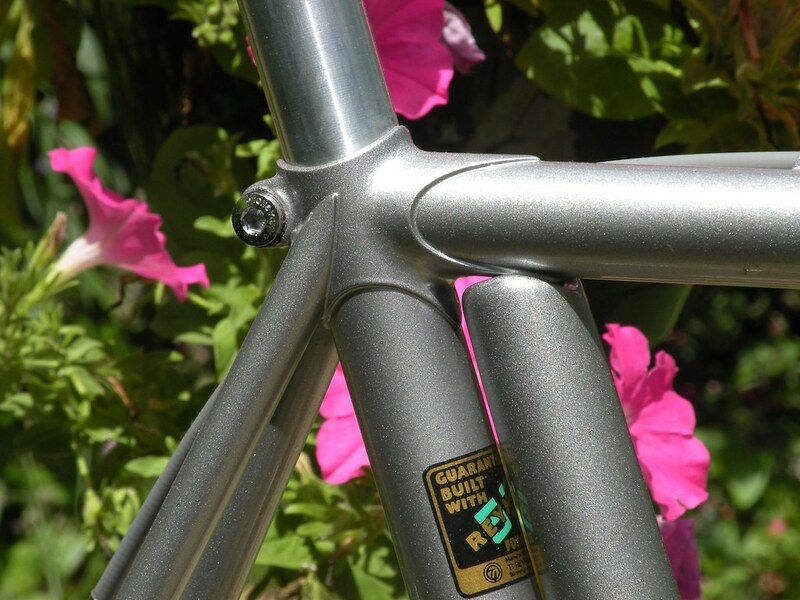 During the peak years, my shop (Toga at first, then changed to cycles de ORO) sold an average of two frames a month. In fact, it was at one of those shows that the original owner bought the frame I have now. When I mention to old-bike-savvy people that I have a McLean, some of them think I'm talking about MacLean, a name from the UK and decades earlier. In the case of the US maker, his full name was McLean Fonvielle, i.e. McLean was his first name. I think @norskagent owns two! Maybe I can get my photographer friend to chime in here, too. Last year, at the Bike Cult show in NYC, someone was wearing an old t-shirt with some old logos, and it included Silk Road/McLean. This is one of those bikes where, even if you don't ride it all the time, you will seriously regret it if you sell it. I made a couple mistakes like this when I was young and broke. I sold my 1978 Gibson V2 guitar for less than it was worth, and I really regret that now. It was a corny looking guitar, but it sounded and played great. I won't make that same mistake with a bike. Plenty of bikes will come and go, but there are some I would never let go of. I do have 2 Mcleans... I will post some pics later. @lostarchitect, I know that, but it's good that you reminded me. Last year, I almost forgot. If I could have just one bicycle, it would be either cyclocross or a road bike like yours, with a relaxed geometry and ample tire clearance. I'll bet it does ride amazingly. I talked to him a couple of years ago and he did. Give him a ring. He's a nice guy. I lived in Chapel Hill when McLean was building Silk Hope (Silkhope?) bicycles but couldn't afford one although a buddy of mine had a beauty. I was stuck with my crappy used Ron Cooper. Don't worry. I won't sell it. 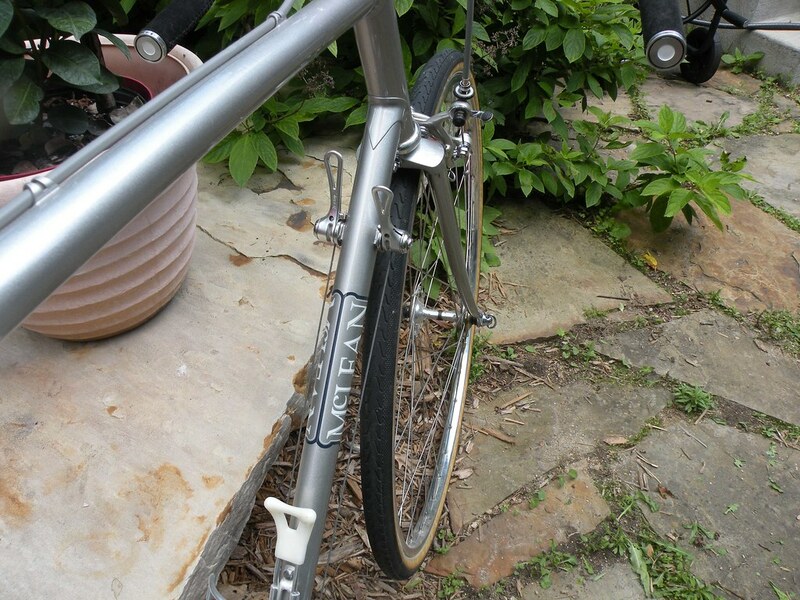 @John E, it has big(gish) clearances, but the angles seem pretty steep, and the fork rake is short. It's the nimblest bike I own, by far. I can't comment on long term comfort, because it's been a while since I rode a century on it and much longer since I toured on it. And last year, I realized that I never really got the fit right. I measured my lowly Bianchi Volpe, because it fits me so well. From that, I determined that my handlebars were too high and also too narrow, and my seat was too high and too far back. Since those adjustments, I took that 50 mile ride and was quite fresh at the end. Cyclocross bikes strike me as one of the most versatile designs. Designed for racing in mud, they are nimble enough for club rides and road racing. They are also stable enough for commuting and touring, and they have big clearances. @gomango, it's tempting, but I can't decide if I want decals or to keep the clean look. I've had a few decal-less bikes, and I like the look. When I had the frame painted, I didn't know about Cycles De Oro, and no one knew where to get decals. Now I could order them from Velocals or other places. This is going to kill you, but I believe the original owner of my frame paid only $250 for it. He sold it to me for $450, because, I presume, he knew he had gotten an insane price on it. Still, I made out like a bandit. That was back in 1983, but it was still quite a bargain. I have since added a campy triple crank to it which I like very much. Last year she contacted me and asked if I was interested in the other Mclean, of course I was! She said she won several races and time trials on this bike and I believe it. It is slightly larger than the other and fits me a little better I think. So he made models? This is the first I'm hearing about them. What are they, racing and Perfect Pleasure? How would you describe them? The models are described in the pamphlets in the Mclean section of the CR site. I believe there was a criterium model also. Last edited by gomango; 06-18-15 at 02:19 PM. I looked at the brochure on the classicrendezvous page, and my frame is not described there. Mine does not have small clearances, which the racing model is described as having. 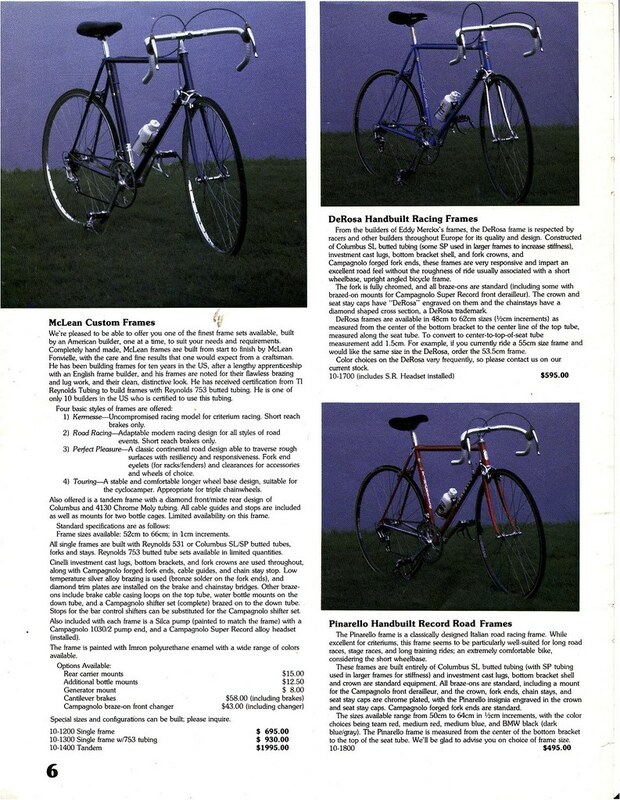 Mine did not have fender eyelets, as the perfect pleasure and touring models had. Other than being a little dusty, I could fill up the tires and hit the road this afternoon. I plan on switching to a set of Mavic GEL 280s/Record hubs with the new Veloflex Vlaanderen tubs. Believe it or not, the bike came with the pictured Panaracer 700x35s! Can't believe they fit and there is room to head up to 700x38 if I should catch a whim. I definitely will ride it with a trusty Regal I have here. I also received another set of tan brake hoods and several sets of new brake pads. Here are a few pics and a link with additional pics. I'll do a thread later when I set it up fully to my tastes. 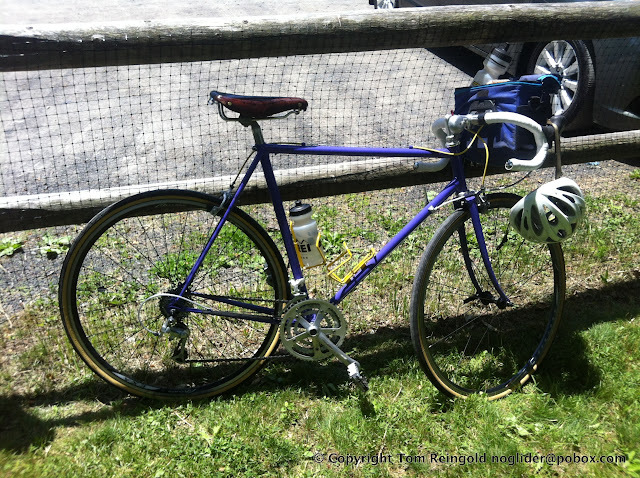 edit: The bike came with a super nice set of Rootboy's bar end plugs that were designed for this bike. Last edited by gomango; 06-18-15 at 03:44 PM. I used to work at Cycles De Oro and really enjoyed my time there and learning " the vintage way ". I can say with certainty that Dale was a huge fan of the McLean marque and was close to the family. I'm sure that if you can get a hold of him, he could talk your ears off concerning these bikes. If so, tell him Law sends his regards. Here are a couple of detail pics of my first Mclean, taken right after I got it. Reminds me of my Kvales quite a bit, except for the cushy ride from the 700x35s on the McClean atm. Maybe I'll ride it on the 27th.